Until a few months ago, I had never eaten Indian food. I mean the kind from India. I have eaten Native American food plenty of times—it’s built into the cuisine of my state and region. But the kind from India, I had avoided. And they were right. I didn’t like it. Of course I never actually tried it. But since I was told I wouldn’t like it, I didn’t. I am reminded of a quote from one of my favorite authors…..It is from the book Illusions, by Richard Bach. It resonates with me because it has so much basis in truth. Basically, it means that whatever your mindset is, is what happens. You create your own reality. So I never ate Indian food. But I did eat some Thai food. Guess what a lot of Thai food has in it? Curry! And I liked it. I liked it a lot. I finally decided to make some a few months ago. Start modestly, I thought. 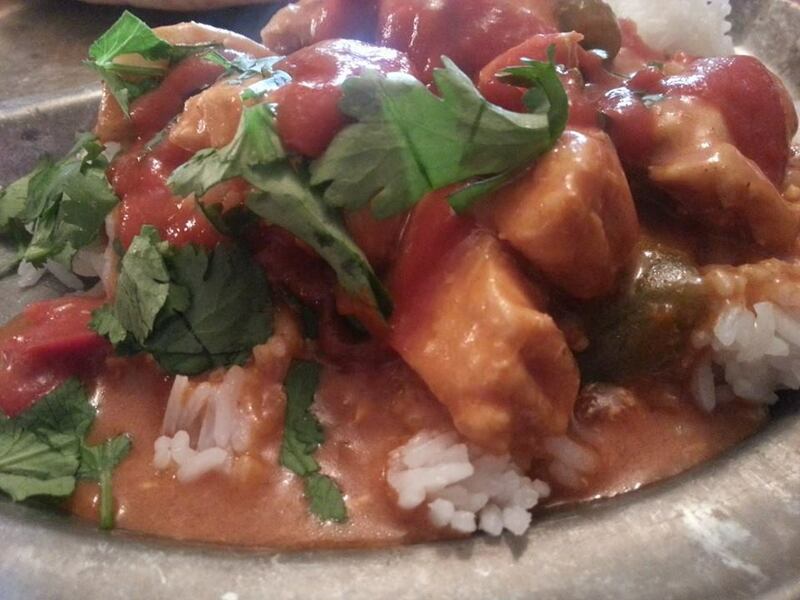 Start with Chicken Tikka Masala, since it isn’t really Indian. I mean, it’s all the Indian flavors, but it was born in England, so it must be pretty tame, right? It wasn’t hot or too spicy. But here’s the thing about Indian food that I think is so off-putting for so many people. It’s. Got. A LOT. Going. On. Flavor overload. For someone who isn’t accustomed to so many layers of flavor, it can be really jarring. A big ol’ slap upside the head. For starts, there are cardamom, ginger, which stateside we are accustomed to mostly in desserts. Then there are more exotic spices, like turmeric and garam masala. Sweet Baby Jesus. It was amazing. My uber finicky 16 year old—you know, the one that only eats chicken nuggets and pizza—he ate two plates full of it. But my hubs and my oldest child would not be taken in so easily. Nope. It stunk, and they had NONE of it. Whimps, I say! I would have to ease them into Indian food, obviously. So, then I looked at some other Indian recipes, and when I saw butter chicken, I thought “this could be the one”. In fact, except for a couple of the spices, this could be Mexican food…I went about creating a recipe that I thought I could sneak onto their sensitive (read: finicky) palates. As I was cooking it, Reagan walks in, looks at the chicken browning in the pot…. I know of course, that he had no idea what that was. But he heard butter, and he LIKES butter. And he heard chicken, and he LIKES chicken. SO, natch, Butter Chicken would be acceptable. Geez, Louise…..Thanks, for blowing my plan, Nate!! Anywho…..they all enjoyed it. The cumin, peppers and tomato were a much more familiar smell when cooking, so they willingly tried what was for them a very exotic offering. And they liked it. It was close enough to fajitas, rice and tortillas that it wasn’t too scary, I guess. In fact, so as not to admit having eaten Indian food, Reagan dubbed the meal “Indian Fajitas”. My husband finally got up the brass to try it late that night, after I was in bed, but he came to whisper in my ear that he tried it, and he liked it, and he ate all of it. Heat oil and butter in a very large skillet (with lid), or a Dutch oven, over medium high heat. Add chicken and cook, stirring occasionally until browned on all sides. Add garlic, onion and peppers, and cook for 5 minutes more. Add all of the spices, and stir to combine. Allow to cook for 2 minutes. Add yogurt, lemon juice, half-and-half and tomatoes. Stir to combine. Reduce heat to medium low, cover and simmer for 20 minutes, while you start your rice cooking according to package directions. After 20 minutes, remove lid, and allow to simmer until sauce is thickened, about 15 minutes. Serve with rice and warm na’an or pita. Chopped cilantro and sriacha sauce are also nice accompaniments. Did you ever use tea to make your rice? The various flavors of tea make interesting rice. This is a recipe I came up with and it’s great as long as you pair it well. Instead of plain water use an herbal tea such as chamomile or green tea. For example: The Steamed Rice Recipe calls for 3 ¾ Cups Water. Boil four cups of water and pour it into a 4 cup measure or large glass bowl. Drop in 4 tea bags to steep for at least 15 minutes and then remove the tea bags. When tea has cooled, use the same amount in place of plain water. Craving some fajitas right now. Uhm! Great story. Generally, if they don’t know what they’re eating, they’ll love it. Like you, it took me a while to be willing to try Indian food. My sense of smell is really sensitive and I’ve had issues with curry (and I’m not a big fan of curry flavoring to begin with…lots of Asian cultures use it in their food, including the one I grew up in). Then I went back home to Chicago to visit my sister and they took me to Little India for dinner. 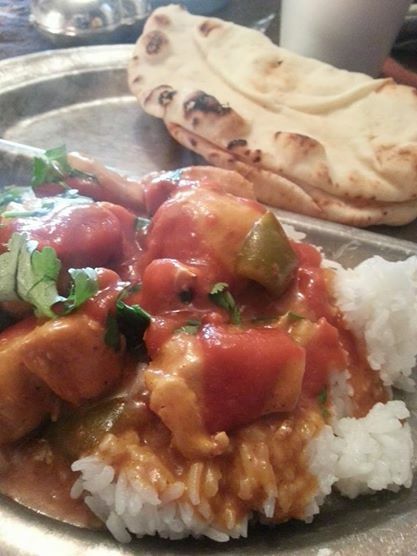 I fell in love with Naan and Chicken Tikka Masala. I even enjoyed the awesome dessert, Gulab Jamun. You should! The ones I mentioned are basically like honey soaked doughnut holes…but warm…and tastier. I’m so glad you’re finally embracing Indian flavors! Ironically, I find them very close to the flavors in Mexican food, especially the cumin, coriander, and cilantro. Great dish!!! garam masala? I understand this blend of spices is regionally different. Was there a particular brand or blend you used? That was hilarious. Mandy and I love Thai food, so when an indian place opened in Midland (not kidding) we decided to give it a shot…and whaddya know, we love indian too. If you are ever in Austin, look up the Clay Pit….very awesome indian food. Can you imagine Greg in an Indian restaurant? This is hilarious! And an eye-opening post for me, at this point I have been eating Indian food for what feels likes forever lol. I am so glad they all liked it! Firstly, thank you for stopping by my blog! And secondly, great post! I love what you did there! It’s actually pretty eye-opening to read about (not an Indian’s) perspective on Indian food, if they’re trying it for the first time. My Aunt (who’s not of Indian descent) says pretty much what you said…but her take is from the side of ‘Indian’s can’t eat subtly flavoured food because we’ve ruined our tastebuds with overload of flavours’ It’s all about training your palette, i guess 🙂 Anyway…good post!